Florida projected win total set for 2018, but will the Gators hit it? Just days after the conclusion of spring practice, the Florida Gators‘ projected win total for the 2018 season was released. While the number is not high, some may see it as an opportunity for the Gators to exceed expectations (and for bettors to make some money). BetDSI has Florida’s win projection at a flat seven games for 2018, which is an interesting number considering the Gators — besides the two years in which they collapsed for reasons that go beyond simply football — have not otherwise fallen below seven wins since 1987. It is also a flat number, meaning the bettor on either side gets the seventh win as a push possibility. This leaves one to decide what is more likely: Florida winning eight games or finding just six victories over the course of the season. 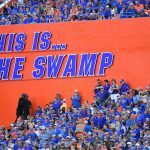 Aside from the annual rivalry games against top-tier talent at Florida State, Georgia and LSU, here’s what UF’s slate looks like for the remainder of the year: Charleston Southern, Kentucky, Colorado State, at Tennessee, at Mississippi State, at Vanderbilt, Missouri, South Carolina, Idaho. Florida could certainly win just six games if head coach Dan Mullen‘s methods and game plans do not take off the bat, but I find it difficult to see the Gators dropping three of six to the Wildcats, Volunteers, Bulldogs, Commodores, Tigers and Gamecocks in Year 1 under Mullen — and that’s assuming they get shutout against the Seminoles, Dawgs and Bayou Bengals. As far as the rest of the SEC East, here’s how their win totals are projected: Georgia (10.5), South Carolina (7), Missouri (6.5), Kentucky (6), Tennessee (5.5), Vanderbilt (5). I can see us winning 10 games next year and that’s assuming we don’t upset Georgia or FSU which we are able to do. Our offense has been worse than watching a bad scary movie the past few seasons. There is no doubt that Mullen will at least put something on the field that gives us a chance to produce some points and give us at least a chance to win next season. With two pick sixes against Michigan last year, I believe Mullen’s offense would have kept us in the game and possibly the win. We may not be great yet next year, but nobody better sleep on us either, because Gators are done sleepin. Go Gators ! 7 Should be easy to beat. I’m with Adam. 8-4 looks like easy money to me. I’m a die die hard gator fan in all sports, an i know this year will be a breakout year for us in football. Im predicting a 12 win regular season an a national championship as we’ll. To all of the pahokee fans.